All transactions are safe and secure with a reliable history in online purchasing behind each of our associates. Buy the Texas Chainsaw Last Chance Gas t-shirt to own Texas Chainsaw Massacre clothing and merchandise. Let everybody know that you are a member of Bubba Sawyer Jr.'s (Leatherface) family. The design on the fronts of these Texas Chainsaw Massacre t-shirts features a logo for the Last Chance Gas Station run by Bubba's brother Drayton. Put this shirt on and tell your friends about your crazy cannibalistic family. Tell them about your brothers The Hitchhiker, Chop Top, and Drayton. Collect movie characters in the form of Texas Chainsaw Massacre toys. 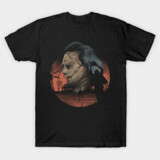 In addition to the Texas Chainsaw Last Chance Gas tee above, browse the Texas Chainsaw Massacre Clothing Gallery for more apparel like men's and women's clothes, kids shirts or hoodies.